This Arugula Pesto Pasta is a delicious and light vegetarian dish that is so easy to make! Eat it plain or top it with chicken, shrimp, fish or steak for a more substantial meal. 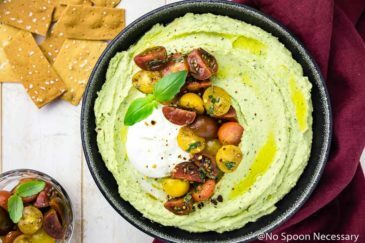 Either way, it’s bursting with flavor and guaranteed to be a crowd pleaser! This post was originally published in April 2016. I’ve updated the post below to include more information about arugula pesto pasta. Plus, I took new photos and added a recipe video to show you how easy this rocket pasta is to make! Hi friends! Hope everyone had a fabulous weekend! Before we get to today’s absolutely delicious dish, I want to quickly say thank you to those of you who read my last post and took time out of your day to leave such lovely, kind comments! Unfortunately, online bullies and trolls come with the blogging territory. And really, meanness in general is something 99.99% of the population has experienced in life. It’s an incredibly vulnerable experience to put your work and creativity out there on the internet for the world to scrutinize. And, I genuinely thank each of you from the bottom of my heart for visiting this blog! You guys, this pasta is legitimately delicious. It has to be, because Boy and I don’t eat a lot of pasta (<- I know, I know, we are boring) so when we do, it must be out of this world delish. Savory, thick, twirl-tastic bucatini is tossed, coated and glistening in a peppery, rich and robust arugula pesto. Topped with creamy mozzarella or torn burrata; juicy, plump tomatoes, crunchy pine nuts; sweet, herbaceous basil and sharp pecorino – this is what light pasta dreams are made of. What is arugula pesto pasta? 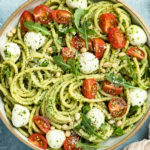 Arugula pesto pasta is a delicious, light vegetarian dish made of rich, peppery arugula pesto tossed with any variety of pasta. 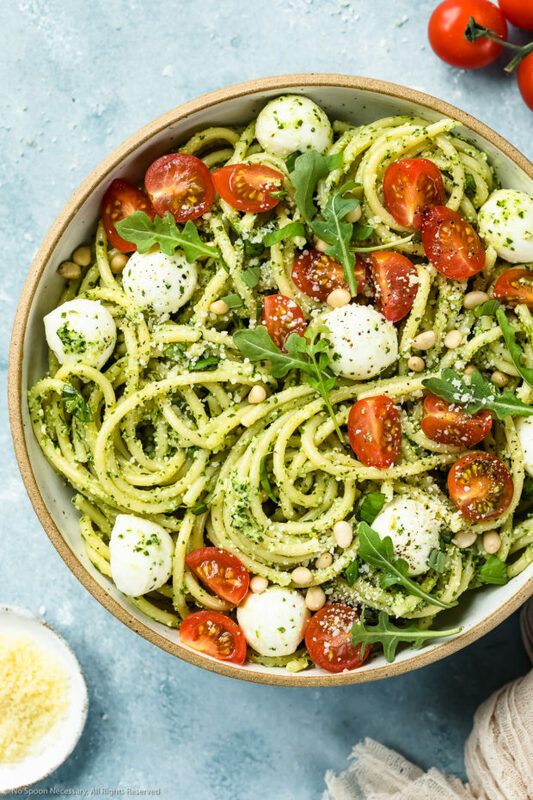 While this robust pesto pasta can be kept strictly vegetarian, you can also add shrimp, salmon or chicken to turn it into a more substantial meal! How to make homemade fresh arugula pesto? Homemade arugula pesto is super simple to make and only requires six ingredients! 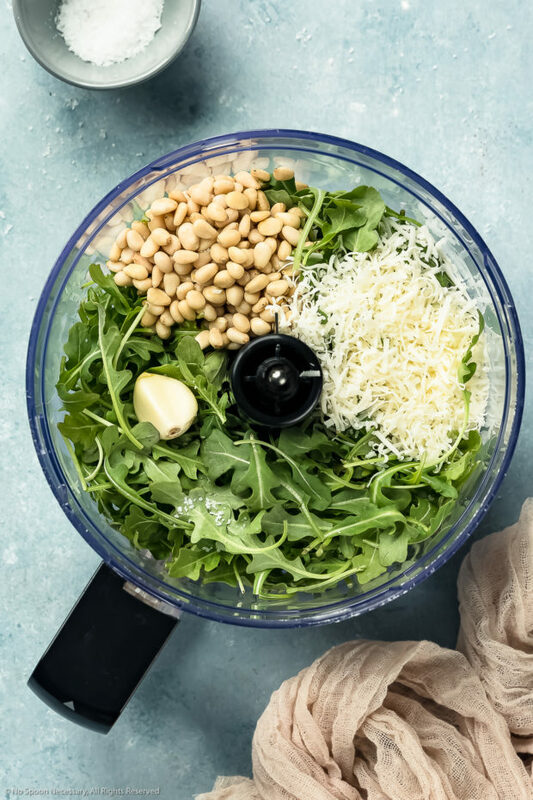 To make arugula pesto, all you need to do is add garlic, pine nuts, arugula, pecorino romano cheese (or you can substitute fresh parmesan) and lemon juice to the food processor. You process all those ingredients together until they are coarsely chopped, and then slowly stream in olive oil with the machine running. Once you have reached your desired consistency, taste and adjust the arugula pesto for salt and pepper. Voilà! Homemade, fresh arugula pesto! How long will arugula pesto keep? Arugula pesto will keep, stored in a sealed container in the refrigerator for up to two weeks. You will need to give it a good stir, or whisk, before using! How do you use arugula pesto? How to serve arugula pesto? 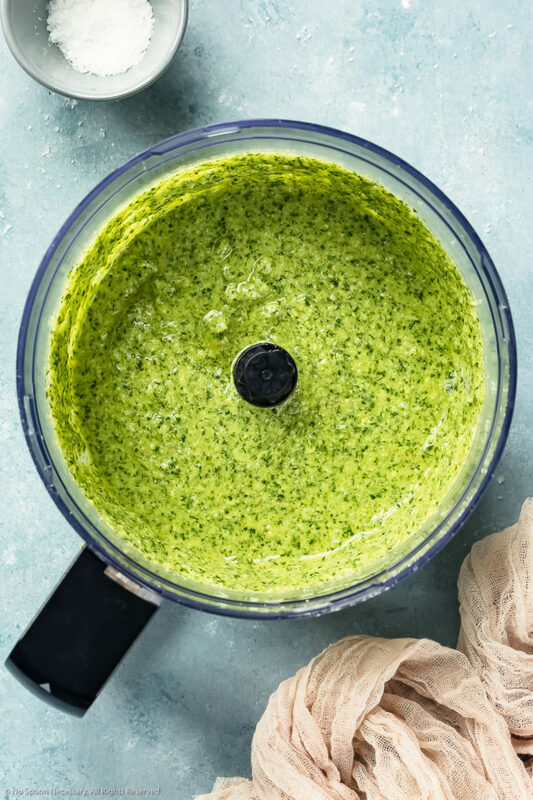 Arugula pesto is the perfect, versatile condiment to have on hand in the refrigerator! 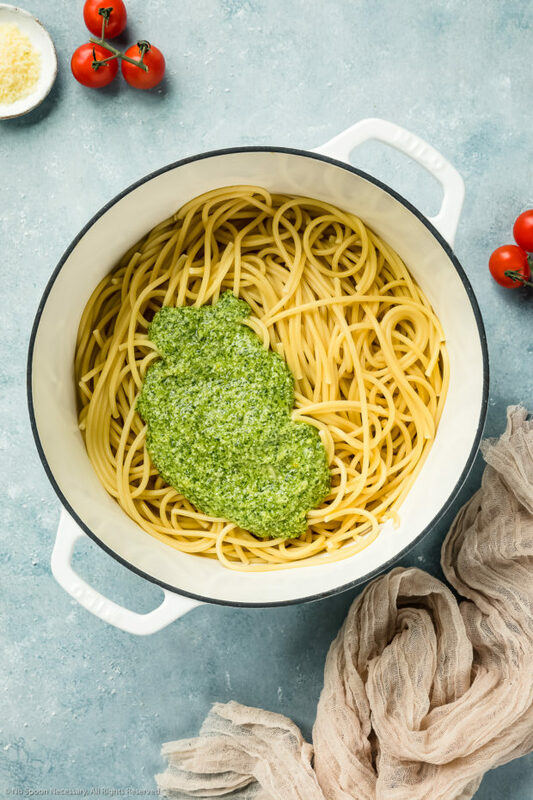 And, while pesto is irresistibly delicious tossed with al dente pasta or veggie noodles, it is so much more than just a pasta sauce! Use it on pizzas. Substitute pesto for tomato sauce on your next pizza or flatbread for a unique experience! Add it to eggs. Drizzle a little pesto on top of your eggs to take your breakfast to the next level! Use is as a base for salad dressings. Add more olive oil and vinegar to pesto for a homemade vinaigrette! Use it as a spread. 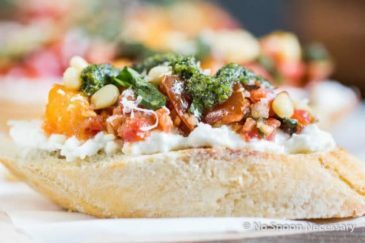 Mix pesto with strained yogurt or mayonnaise and use it as a spread for your next sandwich! Add it to chicken salads. Mix a little pesto into your next chicken salad for a burst of flavor! Use it as a topping or sauce for protein. Spread a few dollops of pesto over grilled chicken, salmon or steak as an elegant finishing touch! Drizzle it on vegetables. Amp up your grilled or roasted vegetables by drizzling a little pesto on top. Or, serve pesto with vegetable crudités (or platter) at your next party for an appetizer that is sure to impress! How to make arugula pesto less bitter? While arugula, or rocket pesto should be peppery and robust in taste, it should not be bitter. To avoid bitter pesto, make sure you pulse all the ingredients in the food processor until finely chopped before adding the oil. As well, make sure you use a high quality extra virgin olive oil. 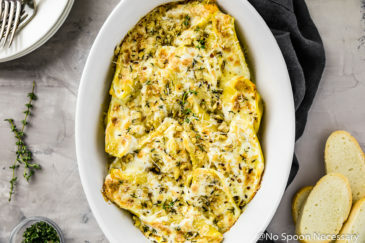 If your pesto still tastes bitter, try adding a bit more lemon juice to cut the bitterness, or increase the amount of grated cheese. I used bucatini pasta because its thick, spaghetti-like texture holds up great with the pesto, but feel free to use whatever pasta tickles your fancy. The arugula pesto recipe below will make enough for 1 pound of pasta, which is enough to feed 4-6 people. If you are looking to feed less mouths, simply halve the recipe. The pesto will keep in the refrigerator, covered, for up to 2 weeks. But, be sure to give it a good stir before using. The pesto pasta with burrata tastes seriously scrumptious cold the next day, so making enough for leftovers is highly encouraged. If you haven’t tried arugula pesto yet, what are you waiting for? 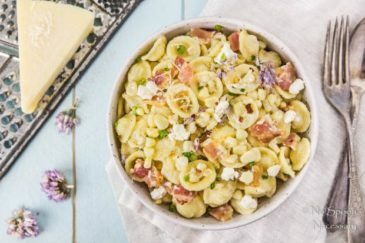 Make this Arugula Pesto Pasta and twirl your way to deliciousness. Until Thursday friends, cheers, and a million thank you’s for being so awesome! 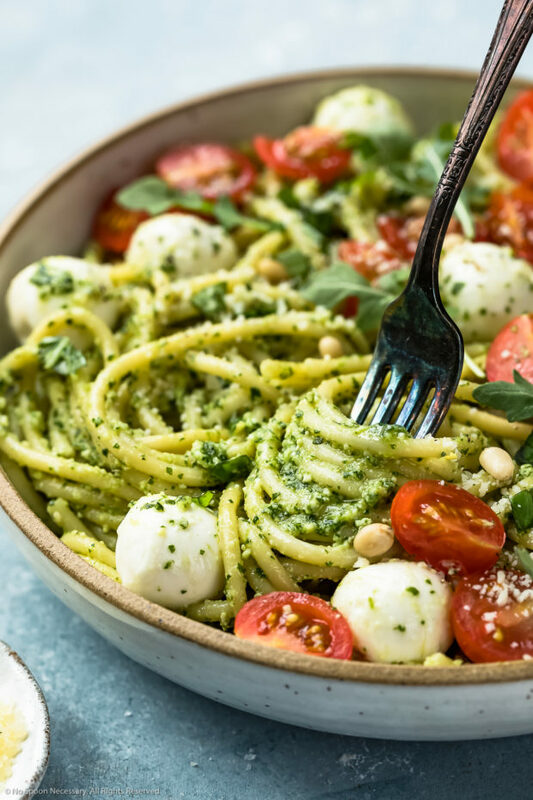 Bucatini pasta coated in rich, peppery arugula pesto and topped with creamy mozzarella pearls, juicy cherry tomatoes and sweet basil. This Arugula Pesto Pasta is delicious and light a vegetarian dish that is so easy to make! Make the Arugula-Pesto: In the bowl of a food processor, combine the garlic and pine nuts. Process until finely chopped. Add the arugula, pecorino and lemon juice. Season with a pinch of salt and pepper. Process until coarsely chopped. With the processor running, slowly add in the olive oil in a steady stream. Process until smooth. Taste and adjust for seasoning with salt and pepper. Meanwhile, cook the pasta in salted water and cook until al dente according to package directions. Drain, reserving 1 cup of pasta cooking water and transfer to a large bowl. 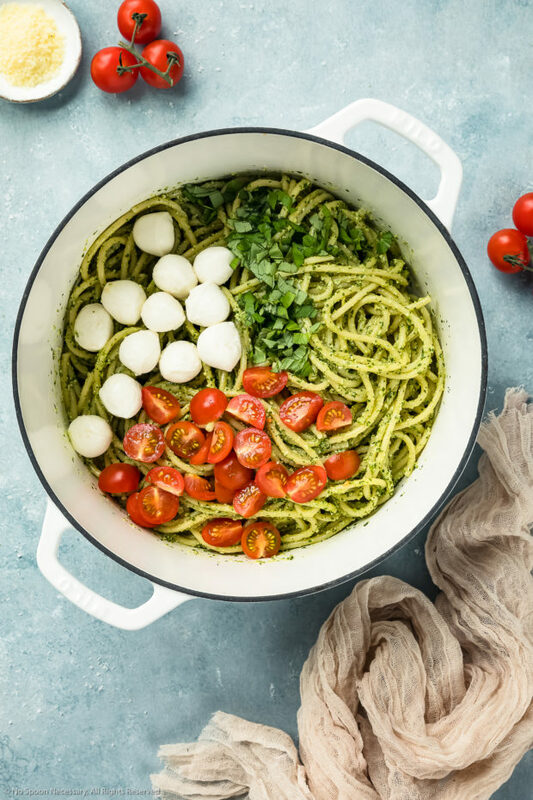 Toss pasta: Add the arugula pesto to bowl with pasta along with 1/4 cup of the pasta cooking water. Toss to coat, adding more water as necessary to create a silky sauce. Add the basil to the pasta along with half of the mozzarella and tomatoes. Toss again until combined. Serve: Divide pasta between serving bowls and top with remaining mozzarella and tomatoes. 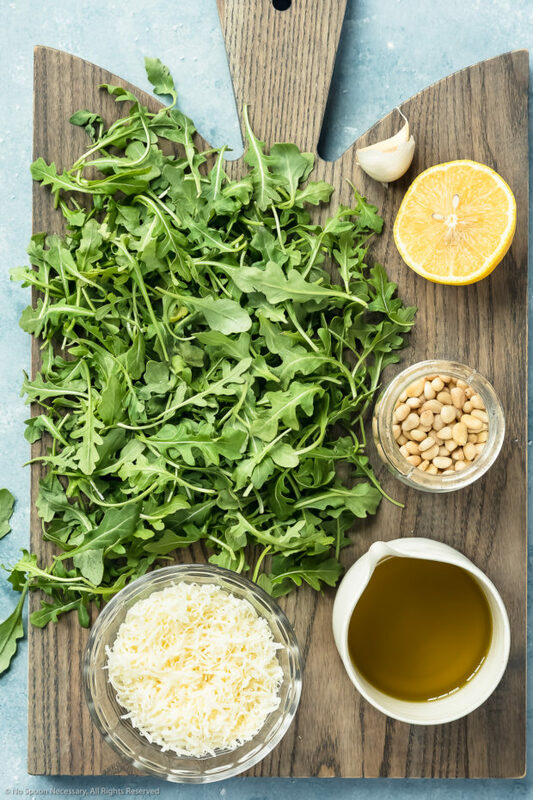 Garnish with additional arugula, pine nuts and pecorino if desired. Serve. If you want to roast the tomatoes: Place tomatoes on baking sheet and drizzle with1 tablespoon olive oil. Season with ½ teaspoon salt and 1/8 teaspoon pepper. Roast in oven for 18-20 minutes, or until tomatoes are very juicy, but not broken down. I think I commented when you first posted this – but I had to stop by and say your new photos look fantastic, Cheyanne! This looks SO GOOD! And so perfect for spring because of that vibrant green :). I’m adding this to my must-try list–which, btw, grows every time you post. . .Have a great week, Chey! Love the new video and photos Chey! Can’t beat an easy, tasty pasta dish like this one. I love making this one especially during the summer when I grab the tomatoes from my brother-in-law’s garden! YES to arugula pesto. I love all of the flavors you’ve got running. Those tomatoes look like pretty little jewels. I want to reach in and pick them right off! What a beautiful dish! Oh yess. I don’t eat pasta very often either because I prefer my calories to come from wine and chocolate. BUT I do have a hankering sometimes and my husband would eat pasta for every meal if he could. So I must pin this because it looks totally amazing! Also those tomatoes!! Heart eye emoji over here. Oh my gosh, this pasta is SO pretty! I love the tomatoes still on the vine– you know they’ve gotta be fresh and flavorful that way! I discovered burrata by accident one time when I thought I was buying a regular mozzarella ball… it was the best accident ever!